The Ramsey County Sheriff's Office has announced the rollout of a liaison program designed to build mutually trusting relationships between law enforcement and the community. Through the program, community-based partners known as community liaison officers will serve as connectors, helping to facilitate open and transparent communication, cooperation and collaboration between the Sheriff's Office and the communities it serves. Community liaison officers will also continue to build on the efforts of the Community Circle, an established Sheriff's Office program designed to expand the dialogue surrounding racial and gender equity, mental health support and pathways to employment. "Law enforcement is at its best when it recognizes that it is not operating in a vacuum and instead reaches outward to build trusting relationships with the people and communities it serves," said. Sheriff Jack Serier. "Our community liaison officers will give us new opportunities to connect on issues and build bridges." Three individuals, Samakab Hussein, Chia Lor and Mai Lor, have already signed on this new role. 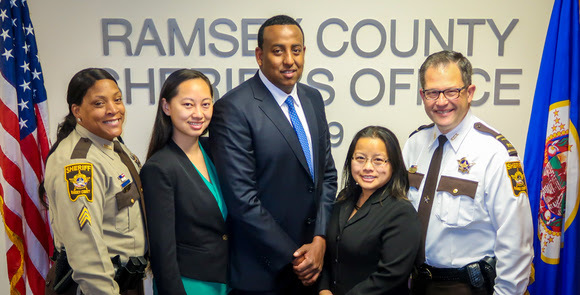 These individuals live and work in Ramsey County's varied and diverse communities and the Sheriff's Office expects to partner with 10 to 12 liaisons total. For more information, please contact Public Information Officer Becqi Sherman at 651-266-9669. Posted on Friday, October 26, 2018 - 4:10 p.m.